The 4 Step Roadmap Concept for PowerPoint is an illustration of GPS map to display timeline journey. It is an editable PowerPoint displaying a road graphics over an image of global positioning system. This template is useful for describing customer journey or similar concepts including product planning or marketing strategies. However, the GPS layout of roadmap concept is highly suitable for topics which may include physical location, journey, or positioning etc. There are four milestones in the roadmap concept template. 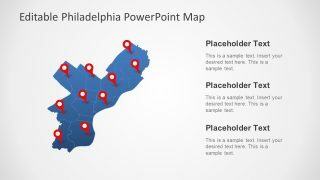 And PowerPoint contains location marker clipart to represent these milestones. 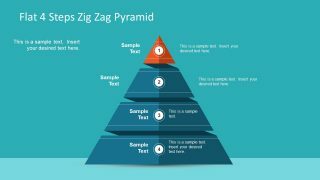 Further, these slides contain text placeholders to insert title and description for each 4 steps. All the shapes and icons of roadmap concept template are high quality vector PowerPoint. 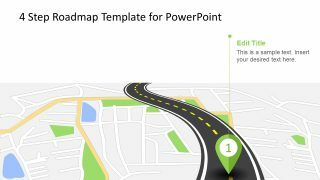 The 4 Step Roadmap Concept for PowerPoint of milestone journey contains four slides. These four slides display the sequence of preceding milestones on curved road. The GPS map design with 4 steps timeline can also demonstrate success roadway. The business professionals, especially in the field of marketing can use roadmap to discuss customer journey. 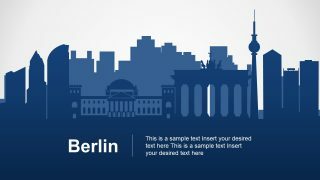 But this template presents a flexible design, enabling users to customize and deliver range of concepts. Like feature startup ideas, entrepreneur and venture capitals. 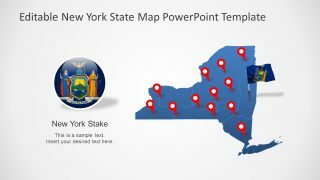 This extendable PowerPoint of flat icons and graphics provide symbols as location pins which are fully editable in size, colors, and styles.